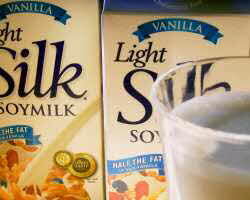 Home > Food Articles > Dairy and Eggs > Soy Milk: What's In A Name? Dear EarthTalk: Is the dairy industry really trying to stop soy milk makers from calling their products “milk?” They must feel very threatened by the preponderance of soy milks now available in supermarkets. Photo: Timothy Valentine, courtesy Flickr. The National Milk Producers Federation (NMPF) would like to stop soy drinks from being labeled "milk," arguing that the terminology is misleading. Soy proponents argue, however, that consumers know the difference between soy milk and dairy milk, that soy milk is less fatty than dairy milk, and that NMPF's efforts are a ploy to hurt the soy industry, which is rapidly gaining market share at the expense of dairy products.